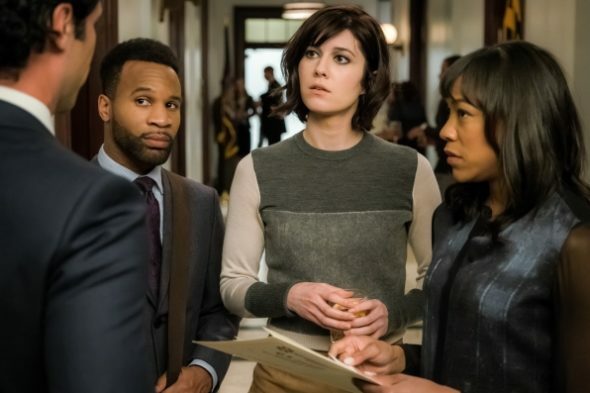 Has CBS killed BrainDead? Network chief Glenn Geller recently discussed the show’s status at the TCA summer press tour. From Robert and Michelle King, the dark comedy stars Mary Elizabeth Winstead as a young Washington DC staffer who begins noticing something wrong with the politicians on Capitol Hill—mysterious bugs are eating their brains. The cast also includes Aaron Tveit, Tony Shalhoub, Nikki M. James, Johnny Ray Gill, Charlie Semine, and Jan Maxwell. So far, the show hasn’t performed as well in the ratings as many of CBS’ other series. Seven episodes into season one, BrainDead is averaging a .46 in the 18-49 demo and 3.054 million viewers. What do you think? Are you watching BrainDead? Would you like another season? I loved Brain Dead. It was hilarious! Please bring it back. Our whole family enjoyed BrainDead and are sorry to hear it might not come back. Please reconsider. It gives us something to think about in these times when we wonder what is going on in politicians minds and a reminder not to take them so seriously. AMAZING SHOW! Hilarious, intelligent, and relevant – please give us a season 2. CBS please reconsider. This is a wonderful and necessary show. If not CBS, how about a smarter network picking it up? Yes please! I don’t have cable, so I watch it on amazon prime. I am in the demo that is getting bad ratings. All the people my age don’t have cable, but we love shows like this. Smart, funny, new. Was very surprised CBS had the balls to give this show a shot but want more! If the producers drop this one, we’ll know where the bugs now reside!! Too good to loose! I want a new season now!!!!!!!! What a brilliant, quirky and increasingly funny series. I’ve just finished binge watching this in the UK on Amazon Prime, and it just got better and better with every episode PLEASE PRODUCE A SECOND SERIES, as it is in my Top Five series of 2016, along with the equally brilliant, quirky and increasingly funny Life in Pieces.